Angling effort was quite low this past week and, as a consequence only 231 salmon were reported. However, with over 6,000 salmon caught so far, anglers enjoyed excellent fishing on the Moy system this year! On Mount Falcon, brothers Nick and Pete Leeson, UK, had their first salmon each, while Roger Stevens, Northern Ireland, had one on bubble & fly on Coolcronan. 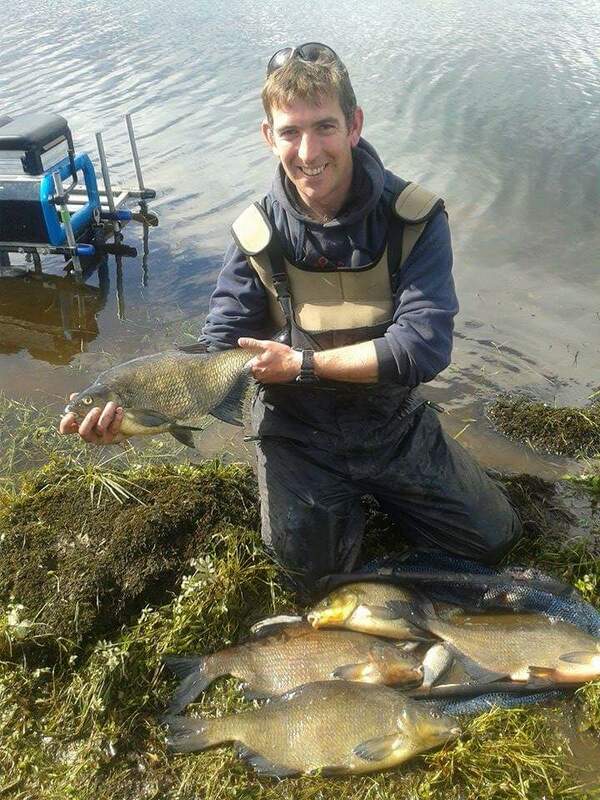 Jean Marie Blouet, France, was successful at the Foxford Fishery where he caught 2 fish on spinner. German visitor, Klaus Krüger, had 3 grilse (one released) on Cloongee. His countryman, Max Milek, enjoyed excellent flyfishing on the East Mayo Anglers' water with a total of 5 fish (3 released) averaging 5 lbs. 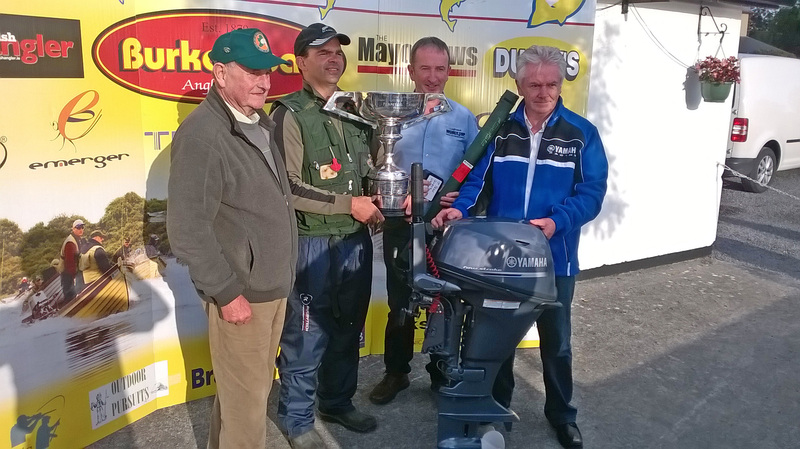 Also on East Mayo, Francesco Basinigazzi, Italy, landed a five pounder on spinner. On Sunday 16th August, Sligo Anglers Association held its annual salmon, sea trout & brown trout competition on Glencar Lake. A total of 16 anglers including 3 juvenile members took part in the event. Unfortunately, the competition was hampered by poor weather conditions for lough style fishing and, as a consequence only one sea trout of 1.5 lbs. and one brown trout were recorded and returned. One salmon was lost by Frank Stenson from Sligo. Winners were Thomas O'Donovan from Ballisodare in the sea trout category and George Lindsay from Strandhill in the brown trout category. Fishing on Glencar Lake is managed by the Sligo Anglers Association, for details contact sligoanglers@hotmail.com. Youngsters Laurence (15 years) and Huw (13 years) Davies from Twickenham England enjoyed a great day's fishing around the Foxford area with guide Kenny Sloan. 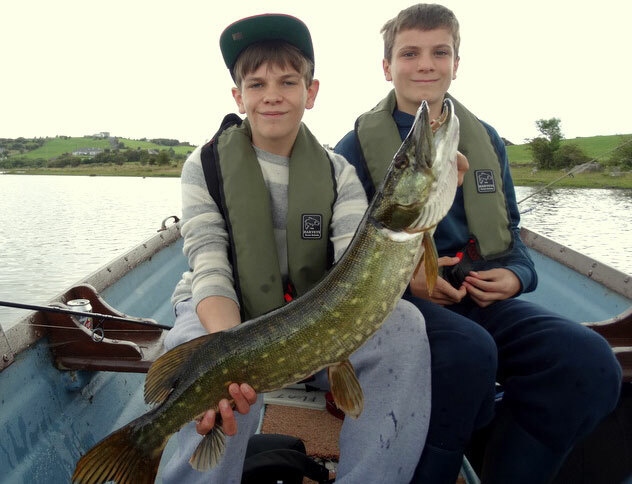 While on a holiday with their parents the two young anglers fancied some pike action catching a total of 6 pike mostly trolling over deeper water. They didn't break the elusive one meter mark but had a number of fine Esox in the high 80s. As this was their first pike fishing experience in Ireland they hope to return in the near future to target more hard fighting Mayo pike. 15 year old Laurence Davies with his first ever Irish pike. Two happy young pike anglers! On the 15th and 16th of August Ballymote Angling Club hosted the I.F.I Open on the shores of Templehouse Lake in Co. Sligo. This year marked the 4th successive year the club ran this event and saw anglers from all over the country visiting Ballymote over the weekend. A new section of the "Island" on Templehouse Lake was included this year to facilitate the growing number of anglers taking part in this competition. As anglers gathered on Friday evening to view the lake and fishing sections everyone talked about last year's winner Ronan Ryan from Galway and his incredible achievement of landing 173 lbs. of bream in a 5 hour match; an achievement that most anglers could only dream of. On Saturday morning registration and the draw for the competition took place at the shore of Templehouse Lake. Registration was conducted with military precision by Caroline and Alex Browne and Inland Fisheries Ireland staff was on hand to transport anglers to the "Island" while the remaining anglers prepared their kit on Kilbratten and the Fort Shore. Weather conditions on Saturday were more favourable to the local farmers than the visiting anglers with hot sunny spells and little or no wind; conditions not really suitable for bream fishing. At 4:30pm the match finished and when weigh-in was completed it was local club member, Billy Horan, who led the competition going into day 2 after catching over 10kg on the first day. The competition was ran on a rotation system, which saw the competition leader, Billy Horan, head to fish the "Island", the most difficult section in this festival. A slight south westerly breeze on day 2 encouraged the bream to feed and as the day progressed the sound of screaming reels could be heard as some anglers battled with the infamous Templehouse bream. In the final hour word travelled around the lake that Big Bob Gilbert from Co. Monaghan was having an excellent day's fishing on Kilbratten Shore with Larry Parks hot on his heels, while on the Island Keith Coleman had landed a few good bream. When the weigh-in was completed Big Bob Gilbert won out his section with an incredible bag of 14kg. After the match, all anglers retreated to Hayden's Bar in Ballymote for refreshments and the prize giving ceremony. Overall winner, Keith Coleman, with his 12kg "Island "catch. Big Bob Gilbert with his bag of 14kg from day two. Ballymote & District Angling Club would like thank the following kind sponsors: Michael Perry of Hayden's Bar Ballymote, John Doddy, Doddy Bar Ballymote, Terry Mann of Shannon Tackle, Jamestown and Inland Fisheries Ireland. A very special word of thanks also goes to the Perceval Family from the Templehouse Estate www.templehouse.ie for their co-operation in hosting this great festival. For information on coarse angling in the Ballymote area check out: www.ballymoteangling.com. Last Saturday finally saw an end to the 2015 World Cup on Lough Mask, after being postponed for almost 2 weeks due to adverse weather conditions on the original date. As always the competition was well supported, with just over 500 anglers participating in this year's event. The final day began with light winds, which for many dry fly anglers was a dream come true, but as the day progressed, the breeze strengthened and the playing field levelled. This year's winner was a very popular David Corcoran from Tuam, Co Galway. David weighed in 4 trout, but also had an additional trout on his ticket which was added to his overall weight using a length/weight conversion chart. The winning catch was 5 trout weighing 5.708lbs. In second position was Darren McGuire from Garrison Co Fermanagh, with 5 trout weighing 4.9010lbs. Third place went to 2013 winner Eugene McCarty from Galway, with 3 trout for 4.4760lbs. Heaviest fish winner was Dominic Kerrigan also from Garrison Co Fermanagh, with a trout of 4.1101lbs. David Corcoran, winner of the World Cup Flyfishing Championships 2015, with main sponsor John Paddy Burke (Burke Boats), Chris Egan (World Cup organising committee chair) and sponsor Tom Staunton (RS Marine). The best under 21 was Gerard McLoughlin from Kells, Co. Meath with an impressive catch of 5 trout weighing 5.494lbs on his heat day. Gerard is a son of the late well-known river and lake angler Pat McLoughlin. Gerard was unable to compete in the final, due to the fact he was representing Ireland in the World River Championships in Colorado, USA on the same weekend. The World Cup committee offered him huge congratulations on his achievement and presented Gerard with a free entry to the 2016 competition. Well known international angler Dorrie Gibbons from Cong took the best lady angler prize with 4 trout weighing 5.826lbs. Partry Angling Club held their annual development fund raising pairs competition over the weekend, which was supported by 157 anglers from all across the country. Competitors had the option of fishing either Carra or Mask on the day. Conditions were difficult, with light winds and bright sunshine which made for tough going. This year's winning pair was Shay Cash and David Bohana, both from Dublin with 4 fish weighing 7.74lbs. In second place were brother and sister team, Martin and Kathleen Feerick from Partry, with 3 fish for 5.245lbs. Third place went to loyal Lough Carra anglers Emmet Stagg and Joe Conroy, with 3 trout for 4.56lbs. Hugh Marshall and Raymond Massey weighed in the heaviest fish which was 2.385lbs. 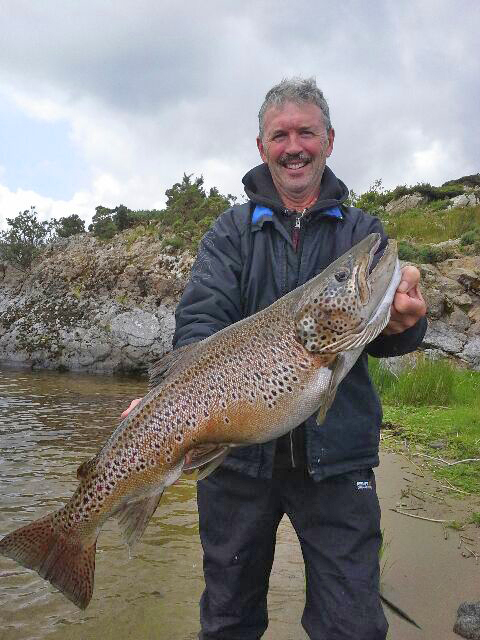 Brian Joyce from Derrypark Lodge with a magnificent 15.5lbs ferox trout caught on Lough Mask earlier this month. Declan Gibbons reports the last week saw good fishing for anglers to mayfly and sedge patterns, with less rod pressure on Lough Corrib due to anglers practicing and participating in the World Cup final on Lough Mask. 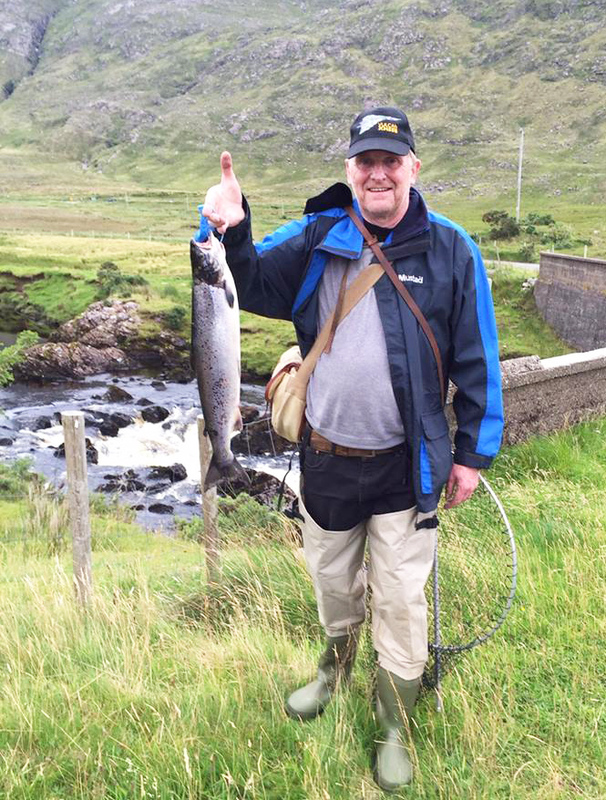 Basil Shields of Ardnasillagh Lodge, Oughterard (091-552550) reports John Maher landed 3 trout on dry sedges on Sunday, with the best fish being 2lbs, and on Wednesday Myles McHugh caught 2 trout on dry mayflies - best fish 2.75lbs. Staying in the Oughterard area Kevin Molloy of Baurisheen Bay Boat Hire (087-9604170) says visiting French anglers Mr Pierre Delbar and son had 3 trout trolling on Monday last - best fish 2.75lbs - and on Tuesday Mr Sebastian Michelle, another visiting French angler, had 2 trout trolling for a half a day's fishing. In the Cong area Frank Costello of Ashford Bay Boat Hire (087-2524253, www.ashfordoldschoolhouse.ie) reports there is good fishing still to be had in the area, with Jim Connell of Ballaghadereen and Manchester catching 4 trout up to 1/75lbs, 3 of which were sportingly released. Jim caught the trout on wet fly and also had numerous smaller fish on his trip to Lough Corrib. In the Greenfields area angler Andrew Boyd and visiting English angler Ben Watson enjoyed a good day's sport on dry may fly and sedge patterns, boating 5 trout between 1.5lbs and 2.5lbs. Larry McCarthy from Corrib View Lodge (087-9135222, www.corribangling.com) was also in touch to report good fishing for clients. 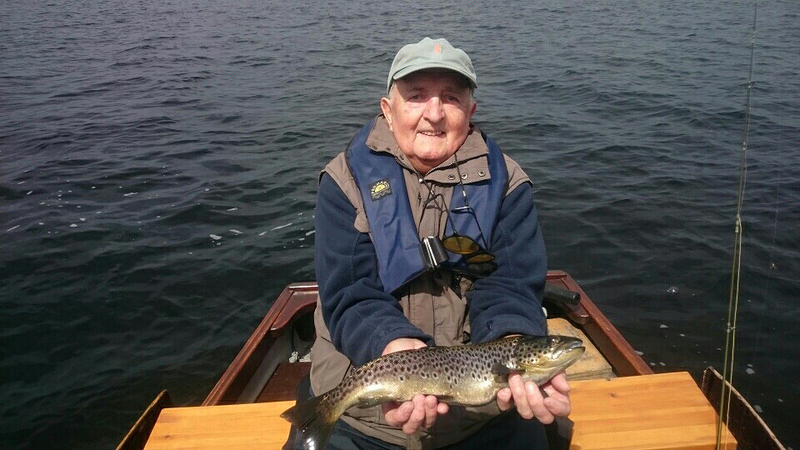 Larry says it was another good week on Corrib with trout on sedge and mayfly patterns; some notable returns were Brendan Burke and Pat Orange from Dublin catching 4 trout on Monday and Tuesday between 2.5lbs and 3lbs - well done Brendan in his 86th year still pulling them out. Paddy Kinneavy fished with Larry on one day and boated 8 fish between 1.5lbs and 3lbs, all on mayfly patterns. Saturday produced 6 trout to dry sedge patterns in the Greenfields area, all sportingly returned. Brendan Burke from Dublin, still tempting wily Corrib trout in his 86th year, with a nice trout caught recently with Larry McCarthy. The Corrib Federation Cup (Catch & Release) is being held on the 23rd of August out of Birchall. Fishing is from 11am to 6pm on a catch, measure and release basis. Entry is €25, with all proceeds going to the federation's fundraising for habitat improvement works on the rivers around Corrib. Entries must be in to Philip Comber at 086 2786301 by Thursday evening when the draw takes place. Fishery manager Osgur Grieve reports on fishing from the 9th - 17th of August. Christopher Williams had 4 grilse for the week weighing 3lbs, 4.5lbs, 4lbs, 4.5lbs from a variety of beats. His brother David had 2 for the week weighing 2.5lbs and 7lbs, 1 of which was released. On the 13th Neil Richmond tempted a nice 5.5lbs grilse to a Sunray Shadow at the Falls Pool which he released; also on the 13th Margaret Downes who stayed with us had a very fresh 4lbs grilse on a cascade which she also returned. Water levels are low again but rain forecast for the second half of the week should improve conditions greatly. A cracking 51lbs tope caught from the shore in Galway Bay by local angler Alan Kelly. 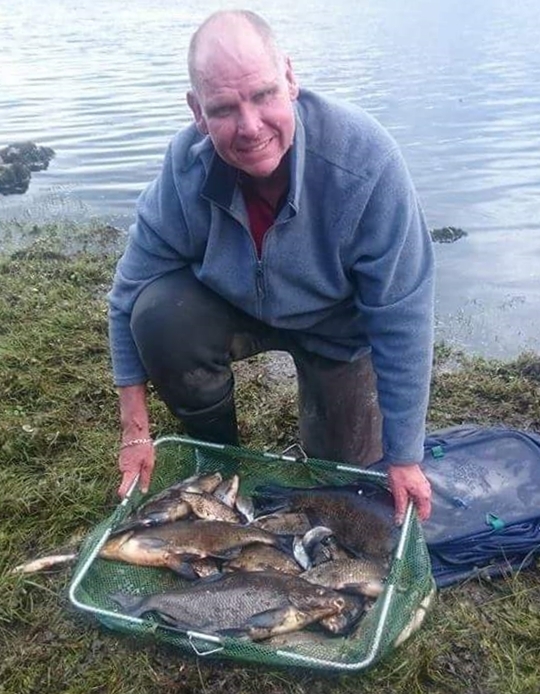 Local sea angler Alan Kelly is a bit of a tope fanatic, although his efforts have been mostly in vain this summer with a poor run of tope in Galway Bay. Alan had put in an incredible 19 sessions and almost 60 hours since May targeting tope on the right tides, only rewarded with the occasional dogfish or bull huss. However, his patience was rewarded last week with a fine specimen shore tope, tipping the scales at 51lbs. In his own words: The evening started off with 3 dog fish on the first 3 casts and I was thinking if dogs are around maybe the tope aren't. As the night drew on the dogs disappeared, weather conditions settled down and darkness fell. All was quiet until - bang! the reel was screaming, line disappearing from the spool at pace. I let the fish run for a while and slowly tightened up the drag, set the hook and then the battle began! Although the drag had tightened up, there was still enough for the fish to run and that it did. I thought at one stage "this beast is not stopping", but after around 25 minutes I managed to get the fish close to the shore - not an easy thing to try on your own. But Imanaged to get her head beached, dropped the rod and made a grab for the tail. My knees where like jelly at this stage! After unhooking the fish - a prime female in great condition - she hit the scales at 51 lbs. I took a few photos and sent her on her way ..."
Elsewhere, there are sporadic reports of mackerel being caught inshore in Galway Bay, so hopefully they will be here in numbers soon. Charter boats are reporting excellent pollack fishing at the moment. 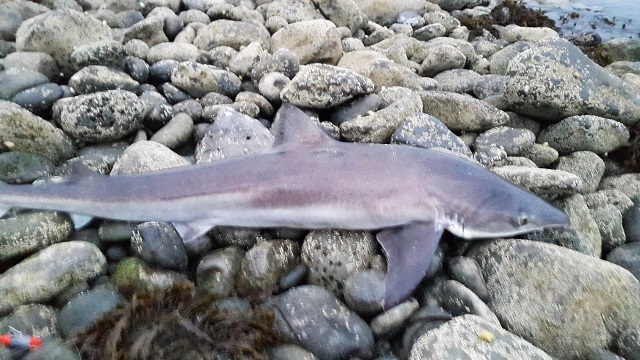 John Brittain, skipper of Bluewater based in Cleggan, also reported catching a monster 6-gill shark, the first for his boat and certainly the first I have heard of in these parts. Well done John! O book fishing aboard Bluewater contact John at 086 2779622.